Did you know? The tongue on a giant anteater can protrude more than 2 feet (60 cm) to capture prey. 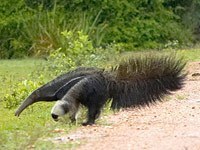 Giant anteaters have tongues measuring up to 50cm, no teeth, and feed on termites as well as ants. Their long hair and thick skin protects them from the bites of angry ants and termites defending their nest. What does a giant anteater eat? 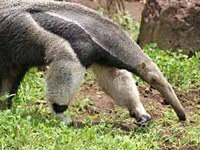 Giant anteaters eat ants, termites and soft-bodied grubs. Using the long, sharp claws on their forelimbs, they open insect colonies and tree trunks. They then use the tongue to collect the eggs, larvae, and adult insects. The salivary glands secrete sticky saliva during feeding that coats the tongue. 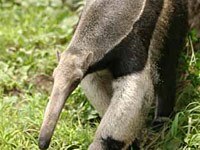 They only stay at one ant colony for a short period of time to avoid soldier ants, but giant anteaters can consume a few thousand insects in minutes. The tongue is attached to the sternum and moves very quickly, flicking 150 times per minute. They sometimes eat fruit and eggs. 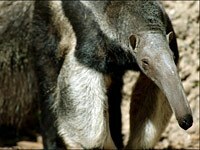 What are the anteaters enemies? The jaguar and the cougar are known predators of giant anteaters. 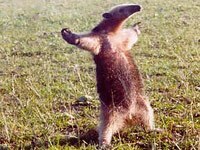 Anteaters use their immense front claws to defend themselves from predators, but their typical response to threat is to run away. Their size makes them invulnerable to all but the largest of predators, jaguars and cougars primarily. They are often killed by humans, either intentionally through hunting or unintentionally through collisions with cars. Download free Anteater wallpapers, click on the image to open the large version. Print free Anteater coloring pages, click on the image to open the large version.